Few things can spruce up a home or add value than a bathroom remodeling project. In a few days or weeks, a tired, dismal bathroom can be transformed into an oasis of relaxation and comfort. Even a minor remodeling project can make the “throne room” look like new with upgraded fixtures and lights. While DIY channels make a bathroom remodeling project look easy, a full remodeling project is best handled by an experienced contractor due to possible issues that may arise. Plus, you can save yourself a ton of aggravation by hiring a pro. Whether you wish to remodel a bathroom by yourself or hire a contractor, the experts at All About Bathrooms note that there are important things that one should consider in order to make the process go as smoothly as possible. Here is a useful bathroom remodeling checklist that you should go over before you begin a project. Budget: One of the most important criteria in any bathroom remodeling project is the budget as it will dictate what actually can be done. The design experts at All About Bathrooms say that not only should labor and item costs be considered but an additional percentage, usually ten percent, should be factored into any bathroom remodeling project due to unforeseen problems that may arise. Come up with a realistic budget and then stick to it. If you don’t have the funds to do a full bathroom remodel, then set your sights lower, such as just replacing faucets and outdated cabinets. Measure: Before embarking on any bathroom remodeling project, one should take every possible measurement available for the bathroom. You’ll be surprised by how often some fixture in your bathroom may not conform to industry standards. With every measurement in hand, one can sit down with a bathroom remodeling contractor to plan out the perfect bathroom and figure out exactly which items will work together and will actually fit within the room’s confines. Ventilation: A lot of moisture occurs in the bathroom, so proper ventilation is a must. Ventilation serves to keep your wooden features dry and helps preserve your health. The right type of fan that is needed and its position will be determined by the size and shape of the bathroom, as well as the placement of showers and tubs. An even better option is to have multiple ways to ventilate your bathroom, such as a fan and a window. Fixtures: A homeowner can become overwhelmed by the sheer variety of fixtures now available to them. The design experts at All About Bathrooms can show you all the various tiles, faucets, showers, tubs, vanities, lights, mirrors, and more that the homeowner now has to choose from and which items really complement each other. One should be aware of what new fixtures will work best in the remodeled bathroom, such as putting in a smaller tub or a corner sink to save space. Deciding on what fixtures you want, such as putting in energy efficient models, long before you begin tearing the bathroom apart is a must. Plus, deciding on which fixtures to use is necessary in creating a realistic budget. Time: An important part of any bathroom remodeling project is time. As the bathroom is one of the most important rooms in a home, it is necessary to know how long it will be out of commission. Any experienced contractor will offer a reasonable schedule to complete the job, barring any major issues that may occur, such as having to bring outdated pipes or electrical wiring up to code. Having a schedule in hand will allow the homeowner to make plans on having the family share any remaining bathrooms or use facilities elsewhere. Storage: A vital consideration for any bathroom remodeling project is the amount of storage space needed. It is very possible to have too little storage space or way too much, both of which can affect the overall usefulness of a bathroom. Too much storage space can cram out desired features, such as a larger tub or shower, while too little can lead to having to keep towels and toiletries in another room or shoved into whatever space is available, causing chaos. The experienced design experts at All About Bathrooms can help you figure out the perfect amount of storage depending upon the size of the bathroom and the number of people using it. Even a small bathroom can have its storage capacity increased through clever shelving solutions. Unforeseen Problems: One final aspect of this bathroom remodeling checklist is to be prepared for unforeseen problems. There is always the possibility of something going wrong, such as the contractor accidentally breaking a pipe or coming across hidden water damage that needs to be fixed. 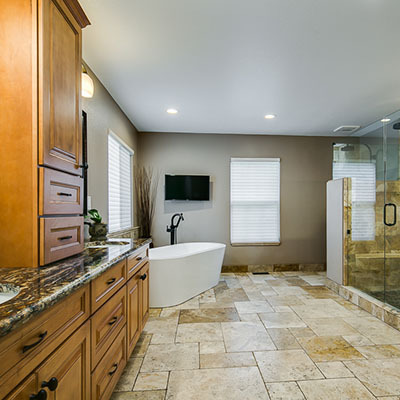 As stated above, an experienced bathroom remodeling contractor, such as All About Bathrooms, will factor in the possibility of minor issues into the budget and time schedule. However, there is the chance of something major being discovered during the bathroom remodeling project that will need to be addressed. It is important to be prepared for such contingencies if they arise. The above bathroom remodeling checklist is a good place to start when planning on redoing your bathroom. There are other factors that may come into play, but the above items are a good general guideline. The important thing is to plan ahead. Sit down with a professional bathroom remodeling contractor, such as All About Bathrooms, to come up with a budget you can afford, a workable schedule, and the fixtures and features that you truly want in the bathroom of your dreams. The more work that is put into coming up with a solid plan beforehand, the less of a headache the actual bathroom remodeling project will be.